Bernie Clark shares how his thinking about exercise has shifted from an emphasis on mobility to an emphasis on stability. This is important to how we think about what we’re doing in all forms of physical yoga. In our youth, we’re more Yang and need to work on strength and stability. As we age, we become more Yin, and therefore need to spend more time working on maintaining our mobility. In the second episode of a 4-part series, Yin master Bernie Clark unpacks the important concept of spinal neutrality and he explores how to think about symmetry, functional asymmetry, and dysfunctional asymmetry in the body. In the first episode of a 4-part series, I welcome Bernie Clark back to the podcast to discuss his new book, Your Spine, Your Yoga. In it, Bernie talks about the main themes in the book including the importance of stability over mobility in the health of our spines. Chinese language tends to describe the Organs and their functions in poetic terms. Their language is metaphorical, often drawing on images from nature and human governance to describe the various processes of human health. Here, Bernie Clark talks about the fascial concepts of dynaments and creep. He discusses some misunderstandings of Yin Yoga, as well as how to think about propping and assisting in Yin Yoga. Listen to Bernie Clark discuss: antifragility, confusion between correlation and causation, the four levels evidence in science, piezoelectricity, and Yin and Yang stress on our tissues. Essential listening for Yin Yoga teachers. Many people express concern about issues of hypermobility and hyperextension in Yin Yoga. Here Bernie Clark explores these concerns and logically defends Yin Yoga. 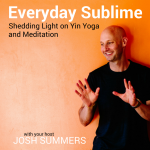 Essential listening for Yin Yoga teachers. For yoga teachers, it can be a challenging process to unlearn rigid rules of alignment and to adapt their teaching to the unique experience of their students. Here, Bernie Clark will walk you through how to think about and teach functional alignment in Yin Yoga and beyond. I often get the sense that when students come to a Yin Yoga class they want to feel good throughout the class, start to finish, particularly when it’s a class that seems on the surface to be “gentle” and “quiet” and “meditative”. And yet, that is not the average newcomer’s experience. At some point during the second or third pose of the sequence, newcomers often evince a grimace of distaste and concern. And this needs to be acknowledged. The third principle of Yin Yoga is to stay still for relatively longer periods of time than you would in an active style of yoga practice, such as Ashtanga or Vinyasa Yoga. The question of how long you should hold the posture often surfaces. By now, you may be anticipating my answer. How long you should stay in a posture depends on a few factors: namely, the tolerance level and strength of the tissue being stressed, and the broader intention behind that stress. The second aspect of executing a Yin Yoga posture is to relax the muscles in the area that you are targeting. Confusion tends to arise when students hear this instruction to “relax the muscles.” There is a tendency to take this as a global mandate that in Yin Yoga poses ALL muscles everywhere MUST relax, but this is going too far. In practice, you endeavor to relax the muscles primarily in the targeted area that you are influencing. It’s this action of relaxing the muscles that shifts the emphasis of the posture’s stress into the denser connective tissues in and around the muscles and the joints. In Yin Yoga, and increasingly in other styles too, there is an emphasis placed on understanding how your body is uniquely influenced by the pose and then from that, making wiser choices about how to align yourself within the pose. How you feel and adapt to what you’re feeling are important elements of Playing Your Edge in Yin Yoga poses. Yin Yoga is an approach to yoga that is meant to be a complementary style of practice to more active styles of postural yoga. The intentions of Yin Yoga are to stimulate, strengthen, and revive tissues of the body that are not emphasized to the same degree as in active styles of yoga, hence its complementary nature. This podcast is intended to be a reflection on and for practice. For many years, I’ve signed off my monthly newsletter with the phrase, “From my practice to yours.” What this attempts to convey is that first and foremost, I’m a practitioner – a Yin yogi, an acupuncturist, a meditator. As a practitioner, I’m committed to a process of learning, refining, unlearning, integrating, and developing. I hope that these reflections on my practice help you with yours.